Snowboarders a special breed. They are fearless. God knows, they have to be to dress the way they do. And when they are not chasing down slopes and breakneck speeds, they can be over heard speaking a language where the words are recognisable but where the meaning leaves any outsider as confused as a chameleon in a smartie box. They use terms like “Air-to-Fakie”,” Boned Out”,” Bonk”, McEgg” and “Steezy”, a term that congers up a visions of a constipated outdoorsman squatting behind a tree with a pained look that screams, “this is not going to be easy”! But apparently this is far off of the mark and the Springboks where against Argentina. In snowboarding speak a participant, who combines “Style” with “Ease” to perform a trick “steez”, is known as a “steezy”. It may seem like a huge leap to translate this into music terms but Cape Town band, The Steezies, achieve this with melodic style and ease. Consisting of George Kirkinis (vocals, guitar), Katie Beard (percussion, vocals), Mark Davis (bass), Bilal Ezzideen (drums), Lauren Davis (percussion), Jono Prest (trumpet), Luke Neville (trombone) and Evan Froud (sax), they are free spited group with steez in abundance. “Snorting Lines of Tumeric” is an audio adventure into multiple genres and sonic landscapes ranging from Afrofunk to Hip Hop to Mbaqanga. It is musical experience where raw and untrained musical enthusiasm clashes with the wisdom of and the production expertise of Raiven Hunter. 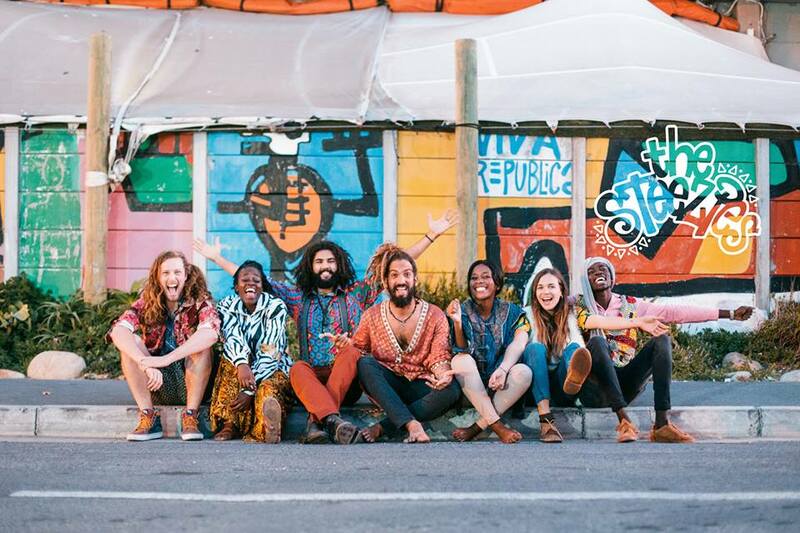 The Steezies have been rated as one of the top 5 up and coming bands by Between 10 and 5, they were rated as one of the top 10 sets at Rocking the Daisies 2017 by Texx and the City. Their show at Splashy Fen 2018 made it to the front cover of the Sunday Tribune, they were termed South Africa’s next big headline act by SA Music Scene, and they have also played romping sets at Up The Creek and River Republic. Their track ‘iAnxous Nauseous‘ made it onto the The Apple Music Indie A-List. Recently they were the “Featured SA Artist of the Week” with The Unicorn on Zone Radio’s SA Music Zone.